"A Greater Middle East is only 'greater' because it includes the entire region and implicates a large number of states in the scheme of 'creative chaos.' The 'new' Middle East is only new, because it creates new alliances and new conditions that allow a deepening and expansion of American control over its resources. ... All Arabs - those who seek change and those who oppose it, rivals of the new regimes and the old, need to open their eyes wide and see what's going on around them." 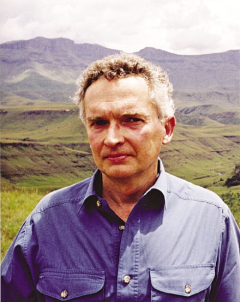 In 2006, retired United States Army Lieutenant Colonel Ralph Peters penned one of the most quoted and controversial articles of the decade: Blood Borders: How a Better Middle East Would Look. Day by day, the mystery that has enveloped America's decade-long notion of a "Greater Middle East," and more recently, that of "creative chaos," has gradually lifted, although intent and true dimensions have yet to be fully revealed. Setting aside suspicion and conspiracy theories, in assessing events across the Arab region since late 2010 and the dawn of the Jasmine Revolution, we can now see various foreign hands, particularly American, that have engaged in forms of intervention into domestic and intra-Arab conflicts. To begin with, one must acknowledge that domestically, the situation in most Arab countries had become sufficiently mature to spark popular movements with the aim of restoring freedom, dignity, and independence, as well as social justice. It was therefore domestic issues that dictated the ways and means of toppling authoritarian regimes. Only rarely, however, were these domestic issues decisive in achieving the goal. These processes were hastened by the early intervention of the U.S. and its Western allies, as commensurate with their interests, to ensure the achievement of their objectives through active involvement in the creation of alternate regimes. While the masses have toiled to overcome barriers of fear and authoritarian oppression to set up systems that carry out reform and open the way to freedom, dignity and social justice, America and its allies have sought to replace loyal regimes with ones that are even more loyal, particularly to the cause of American-Israeli strategic interests. Even setting aside its pouring of fuel onto the flames ravaging Arab society, America's role in this "creative chaos" is all too obvious, often thanks to the comments of American officials themselves. The exhaustion of Arab societies, the destruction of their infrastructures, right down to the disintegration of state structures, are certainly due in part to what we know are American objectives. The foremost of these objectives fall within the context and meaning of the "Greater" or the "new" Middle East, relating to the tearing apart, Sykes-Picot style, of Arab geo-political units. A Greater Middle East is only "greater" because it includes the entire region and implicates a large number of states in the scheme of creative chaos. 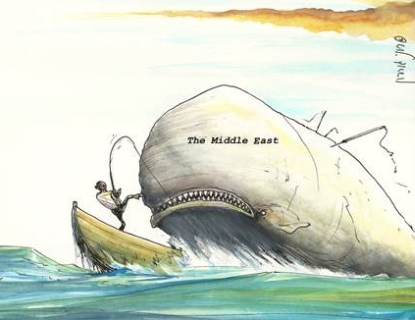 The "new" Middle East is only "new," because it creates new alliances and new conditions that allow a deepening and expansion of American control over its resources. 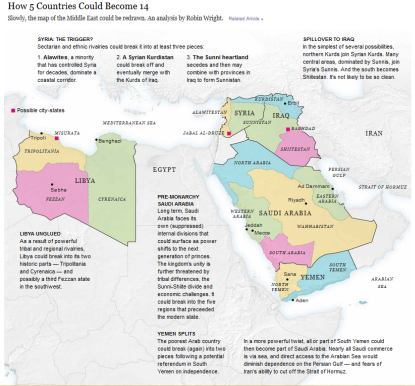 The New York Times on Sunday published a map [above] showing the partitioning of five Arab states into fourteen new mini-states, describing the modern Middle East as a "political and economic pivot in the international order," which it says "is in tatters." On September 28, Robin Wright, an analyst at the newspaper, published this vision for the division, in which Syria is split into three units, Saudi Arabia into five, Libya into two or three, then there is Iraq, Sudan and Yemen. The Maan News Agency quotes Wright as saying that the remapping would be a strategic game changer for all, and is likely to lead to "reconfigured alliances, security challenges, trade and energy flows for much of the world." It's clear why Egypt isn't included on Wright's New York Times map: it was published after the second popular revolution of June 30, a movement that at least for Egypt, has slowed progress for the partition scheme. The World Tribune Internet site reported that former chairman of the Joint Chiefs of Staff, General Hugh Shelton, said that the Obama Administration is working to destabilize Egypt and Bahrain. The Tribune, in a dispatch originally carried by the Sama News Agency, reports that Shelton admitted that Egypt has succeeded in foiling Obama's 2013 campaign, noting that it was Egypt Defense Minister Abdul Fatah Sisi who detected the plot. Shelton reportedly said that had President Morsi not been deposed, Egypt would have become another Syria, and Egypt's Army would have been completely destroyed. Apart from plots, maps, statements and confessions, events on the ground confirm the direction. Everyone is aware of the division of Sudan and the potential for yet further divisions there and attempts being made to divide Yemen into north and south. Everyone knows where things are headed in Libya, which is at risk of breaking up into three mini-states: Fazzan, Burqa and Tripoli. And we all know what's going on in Iraq, and of course, the suffering of the Syrian state. So a majority of Arab countries are being confronted with wither miniaturizing partitions or self-destruction. Second, these divisive and destructive schemes serve the security strategy of Israel. They serve the valuable service of opening doors, not only to the confiscation of Palestinian and Arab rights, but to the realization of Israel's expansionist ambitions in the region by ensuring an absence of a force capable enough to confront it. The third objective is to bring about a resolution of the Palestinian issue that does not lead to the creation of a Palestinian state on land occupied in 1967, but as part of a wider regional resolution, which leading Arab commentator Mohamed Hassanein Heikal has repeatedly warned against. Putting aside Israeli assertions and Egyptian claims, the scheme for a wider resolution is to create a Palestinian state that accepts Palestinian refugees on a Gaza Strip that stretches into the Sinai. The failure of this scheme, however, does not leave Israel without alternatives, none of which include the creation of a Palestinian state on territory occupied in 1967. The fourth objective is to grant legitimacy to Israel's murderous activity, including its continuing to massacre Palestinians without having to worry about the condemnation of the international community. In the period leading up to the Arab protest movement, Israel committed a massacre against the population of the Gaza Strip in which over 1,500 people lost their lives, and more than 5,000 were injured. All of this occurred without Israel receiving the punishment it deserved. Now, if Arabs in their struggle for change are paying dearly with dozens or even hundreds of thousands of lives, as is the case in Libya and Syria, how will Israel conduct itself in the face of its Palestinian and Arab foes? All Arabs - those who seek change and those who oppose it, rivals of the new regimes and the old, need to open their eyes wide and see what's going on around them. All must be God-fearing in their actions, which affect their countries and people. All must concede that the path to real change is one that meets the aspiration of the oppressed masses for freedom, dignity, and social justice, and they must desist from self-destruction that serves no purpose other than the pursuit of vengeance to the benefit of American-Israeli schemes.